This almost flourless chocolate cake will make you look like a professional baker. This cake is perfect for any holiday or dinner party. 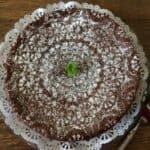 I have made this cake countless times, and guests are always crazy for this cakde which is chocolatey and rich, but not too rich and not too sweet. The texture is a bit cakey and a touch fudgy. It’s just right; in fact, it’s addicting.